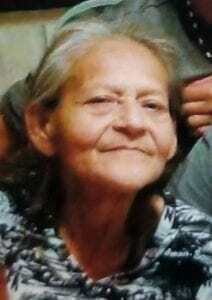 Maria Ines Aguero Acevedo, born July 1, 1955 in Poteet, passed away Friday, March 30, 2018 in San Antonio, Texas. Mrs. Maria Ines Aguero Acevedo was preceded in death by her father, Ildefonso Aguero, Jr; mother, Guadalupe Aguero; daughter, Maria Emilia Estrada; sister Sarapia Aguero and grandson Alberto Chapa Marroquin, Jr.
She is survived by her daughter, Maria Celia Marroquin (Alberto); grandson, Angel Manuel Chapa; granddaughter, Karizma Lynn Estrada; grandson, Cristobal Estrada, Jr.; granddaughter, Maria Guadalupe Hernandez; granddaughter, SanJuana Marroquin; grandson, Simon Marroquin; great grandson, Mario Emilio Lopez, Jr.; great-granddaughter, Maleficent Lopez; great-grandson, Guillermo Garcia, Jr.; sister, Justina Morales (Juan); brothers, Domingo Aguero and Genero Aguero (Janie Lynn); cousin, Leo Alaniz; like a son, Miguel Lopez III; niece, Lorraine Lopez; nephews, Ildefonso Garcia, Tony Morales, Jose Morales, Juan Antonio Aguero, Daniel Aguero and numerous other relatives and close friends. Visitation will take place on Friday, April 6, 2018 from 4 – 9 p.m. at the Camero Funeral Home. A prayer service will be held Friday evening at 7 p.m. at Camero Funeral Home.